Our Confetti Garden™ ‘Kir Royal’ Combination is a mixture of Aloha Pink Calibrachoa, Empress Flair Violet Blue Verbena and Potunia Blackberry Ice Petunia. All of this collection has been bred by Dummen and are bred for vigorous growth, larger-than-average blossoms and lush, tropical colors. This sun-loving combo, befitting royalty, will also perform well in areas that receive partial or dappled late afternoon shade. 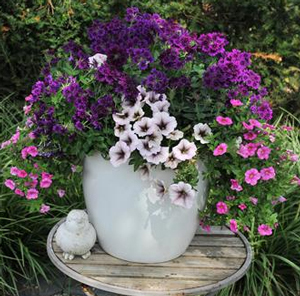 Plant in hanging or standing containers, or in the landscape, where their trailing habit is allowed to show off. The plants in our 'Kir Royal' plants are grown and shipped in fine quality growing medium and are guaranteed to arrive alive and ready to thrive.